Well, we had fall weather in California for a minute, but now it’s back to the heat. For now- apparently the weather is going to dip again next week but we’ll see. Regardless, I’m already in full-on fall mode. So today I’m sharing the best DIY Chai recipe! My aunt has made this tea for years and it’s the best. It’s delicious and insanely easy to make once you try it a few times. 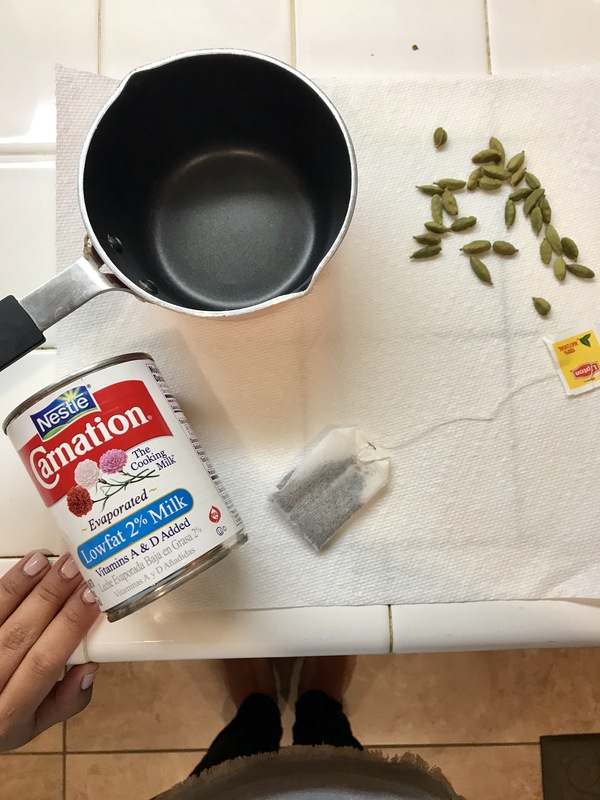 You will need: Cardamom seeds, black tea bags and evaporated milk. SO easy! First, slightly crack open the seeds. This helps to infuse all the cardamom flavor into the tea. The ration is one seed per cup of water but if I want a little more of the spice I’ll add two. Then add the seeds to a cup of water and bring it to a boil. After a minute or so, add the black tea bag (I recommend Lipton). Let that sit for a minute in boil. Try not to let it boil for longer than that- it can make the tea more bitter. Pour into your mug and add evaporated milk and sugar as needed to sweeten! Easy enough right? This recipe is definitely simple enough- the tricky part is just watching your time. The first time I tried to make this on my own, I wasn’t paying as much attention and definitely over-boiled the tea. But now I’m much more attentive and it comes out more to my liking. This is one of my favorite year-round tea recipes, but especially during the fall!